The closest orbit between a star and a black hole ever seen has been discovered. This extraordinarily close binary is found in 47 Tucanae, a dense cluster of stars on the edge of the Milky Way. This binary contains a white dwarf, a low-mass star that has exhausted most or all of its nuclear fuel, and a stellar-mass black hole. X-ray data from Chandra provided information about both the presence of the white dwarf and the period of its orbit around the black hole. This graphic features an artist's impression of a star found in the closest orbit known around a black hole, as reported in our latest press release. This discovery was made using data from NASA's Chandra X-ray Observatory (shown in the inset where low, medium, and high-energy X-rays are colored red, green, and blue respectively), plus NASA's NuSTAR telescope and the Australia Telescope Compact Array. Astronomers found this extraordinarily close stellar pairing in the globular cluster named 47 Tucanae, a dense collection of stars located on the outskirts of the Milky Way galaxy, about 14,800 light years from Earth. This particular source, known as X9, has been of interest to scientists for many years. 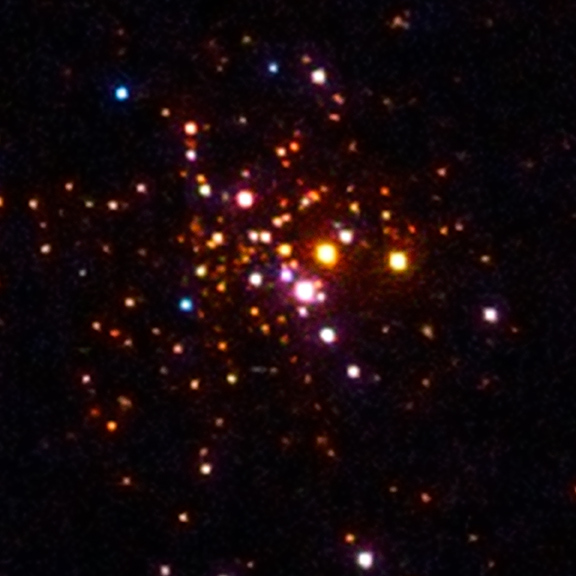 Until a couple of years ago, astronomers thought X9 contained a white dwarf pulling material from a companion star like the Sun. (Astronomers call a pair of objects orbiting one another a 'binary' system.) However, a team of scientists in 2015 used radio data to show that X9 likely consisted instead of a black hole pulling gas from a white dwarf companion. 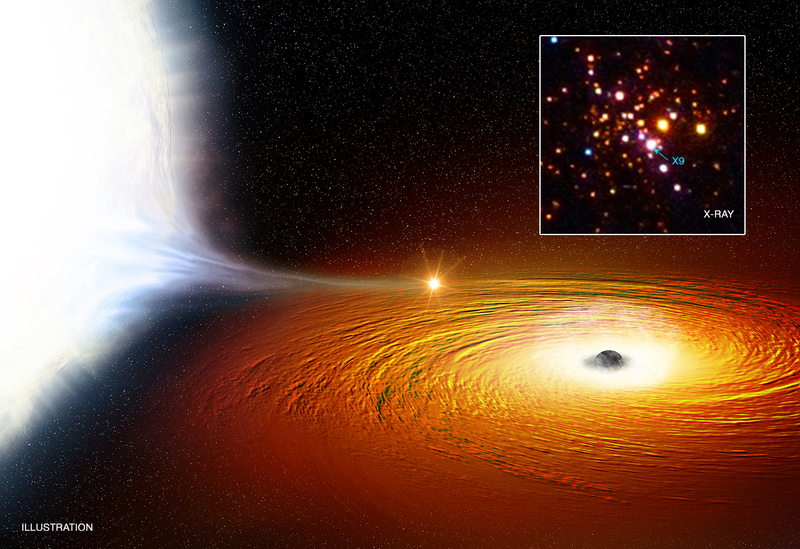 These researchers predicted that the white dwarf would take only about 25 minutes to orbit the black hole. New Chandra data likely verify this hypothesis and reveal that the X-rays change periodically over about 28 minutes. Additionally, Chandra data show evidence for large amounts of oxygen in the system, a characteristic for the presence of a white dwarf. Therefore, a strong case can be made that that the companion star is a white dwarf, which would then be orbiting the black hole at only about 2.5 times the separation between the Earth and the Moon. As seen in the artist's illustration, the white dwarf is so close to the black hole that much of its material is being pulled away. If it continues to lose mass, this white dwarf may evolve into some exotic sort of planet or completely evaporate. In order to make such a close pairing, one possibility is that the black hole smashed into a red giant star, and then gas from the outer regions of the star was ejected from the binary. The remaining core of the red giant would form into a white dwarf, which becomes a binary companion to the black hole. The orbit of the binary would then have shrunk as gravitational waves were emitted, until the black hole started pulling material from the white dwarf. The gravitational waves currently being produced by X9 have a frequency that is too low to be detected with Laser Interferometer Gravitational-Wave Observatory (LIGO). It could potentially be detected with future gravitational wave observatories in space. An alternative explanation for the observations is that the binary contains a neutron star, rather than a black hole, that is spinning faster as it pulls material from a white dwarf companion via a disk. This process can lead to the neutron star spinning around its axis thousands of times every second. A few such objects, called transitional millisecond pulsars, have been observed near the end of this spinning up phase. The authors do not favor this possibility as transitional millisecond pulsars have properties not seen in X9, such as extreme variability at X-ray and radio wavelengths. However, they cannot disprove this explanation. In addition to Chandra, NASA's NuSTAR telescope, which observes higher-energy X-rays, and the radio telescope Australia Telescope Compact Array were used to make this discovery. A paper describing these results was recently accepted for publication in the Monthly Notices of the Royal Astronomical Society and is available online. The authors on the paper are Arash Bahramian (University of Alberta), Craig Heinke (Alberta), Vlad Tudor (Curtin University and ICRAR), James Miller-Jones (ICRAR), Slavko Bogdanov (Columbia University), Thomas Maccarone (Texas Tech University), Christian Knigge (University of Southampton), Gregory Sivakoff (Alberta), Laura Chomiuk (Michigan State University), Jay Strader (Michigan State), Javier Garcia (Harvard-Smithsonian Center for Astrophysics), and Timothy Kallman (Goddard Space Flight Center). Coordinates (J2000) RA 00h 24m 05s | Dec -72° 04´ 53"
Absolutely spectacular. I had no idea that a planet could form from a depleted white dwarf. I love this site. Great work by Chandra as we explore the universes to make ourselves whole. A binary system where a star is closely orbiting a black hole. About 14,800 light years from Earth. The inset image is about 6.5 light years across. X-rays are red, green, and blue.